The agencies involved were Catholic Charities (U.S.) and SocialWelfare Society (ROK). My Korean name is Kim, Seung Dae (김승대). I was 4 years, 2 months, and 4 days old when I arrived in Minnesota (April 19th, 1989). The story goes that I was found “abandoned" on a construction site of Green Apartment in Bonghwang-dong, Kimhae-shi, Kyungnam at around 6:00 on April 16th, 1985. [My case number is 88-1223/SJH and it was handled by Social Welfare Society]. A minute detail with information about my past was left on a piece of paper - day of birth, March 15th, 1985. Absolutely nothing else was found. No parent’s name, no address, and interestingly enough no name. According to my adoption papers I was a loving infant and quite shy at first, but as I grew older my conformability increased and I interacted pleasantly with the other orphans. A hearty eater, there were few foods I did not enjoy and few activities I did not entertain. When my director informed me I was moving to America my initial response was “I do not want to go to America” but she was able to reassure me everything would be fine. Being a KAD has had a huge impact on my career. Towards the halfway point duringmy senior year of college, I had a burning desire to explore being Korean. I didn’t know what I wanted to do after graduating and I had an opportunity to work and live in Seoul. I grabbed the opportunity and put my career on hold. I initially went over to Korea to teach English for 1 year. After I finished my contract I attended graduate school for 2 years. At Yonsei University, I started work towards my Master's Degree in March of 2009, and received my diploma in February of 2011. It was a 2 year program and I obtained a Master of Arts in International Relations with an emphasis in International Management. I attended school with people from all over the world and it was a very multicultural atmosphere. Upon completion of graduate school, I returned to teaching English since it was very difficult for me to find a professional type of job; being bilingual is pretty much a necessary requirement. In total, I spent about 5 years in Korea. 5 years later, I am back in MN and am beginning my career. Despite this detour, I am more mature and comfortable with my identity. I believe a lot of people don’t know what their identity is (non KADs included). I would recommend everyone to put their career on hold for at least 1 year and do something that is challenging and satisfying. I know this is easier said than done, however, for seniors in college it is the perfect time. The KAD community in MN, specifically AK Connection, has been great. I enjoyed the Chuseok get together and the most recent Sledding/Hoban/Noraebang get together. It is always nice to meet other KADs and to socialize with them. This is the first time I have ever been involved with a KAD community. I had heard about GOA'L while living in Seoul, but never attended any events. Pork and Mixed Rice (제육볶음밥/덮밥), Bibimbap in a HotBowl (돌솥비빔밥), Army Base Stew (부대찌개), Bean Paste Stew (된장찌개), Kimchi Stew (김치찌개), Tofu Stew (순두부찌개), Rice Noodle Dumpling Soup (떡만두국), Jjim Dak (찜닭), Seafood Pancake (해물파전), Filled Korean Pancake (호떡), Tuna Rice Roll (참치김밥), Japchae (잡채), Bulgogi with Rice (불고기백반), Bean Sprouts (콩나물), and Anchovies (멸치). 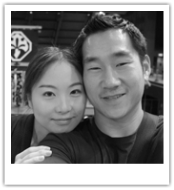 Note: In the photo with Mark is his wife, Hae-Young.